Whisk the Egg White, 2 Tsp Rice Wine Vinegar, 1 Tbsp Cornflour and the salt in a large bowl until well combined. Place the Chicken Pieces in the marinade, cover and refrigerate for at least 30 minutes or as long as you can in advance. Mix the Soy Sauce and 1 Tsp Cornflour together in a small bowl until the cornflour is completely blended in and then add the remaining sauce ingredients (except the sesame oil ) and set aside. Bring a large pot of water to the boil and add the marinated chicken a few pieces at a time so they don’t stick together. Simmer the chicken for approximately 8 minutes or until cooked through, drain and set aside, cover to keep it warm. 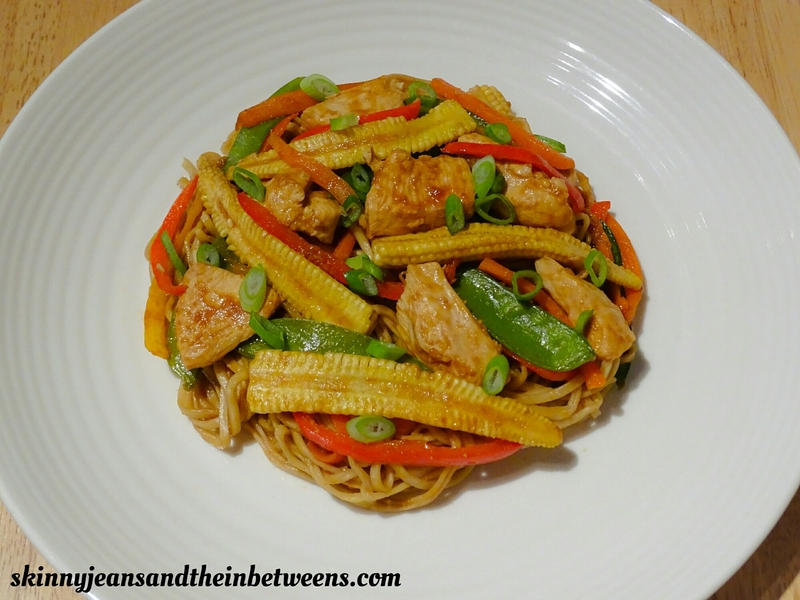 Meanwhile prepare the noodles according to packet instructions and heat a large non stick pan sprayed with oil. Fry the veggies except the spring onion until softened, about 5 minutes. 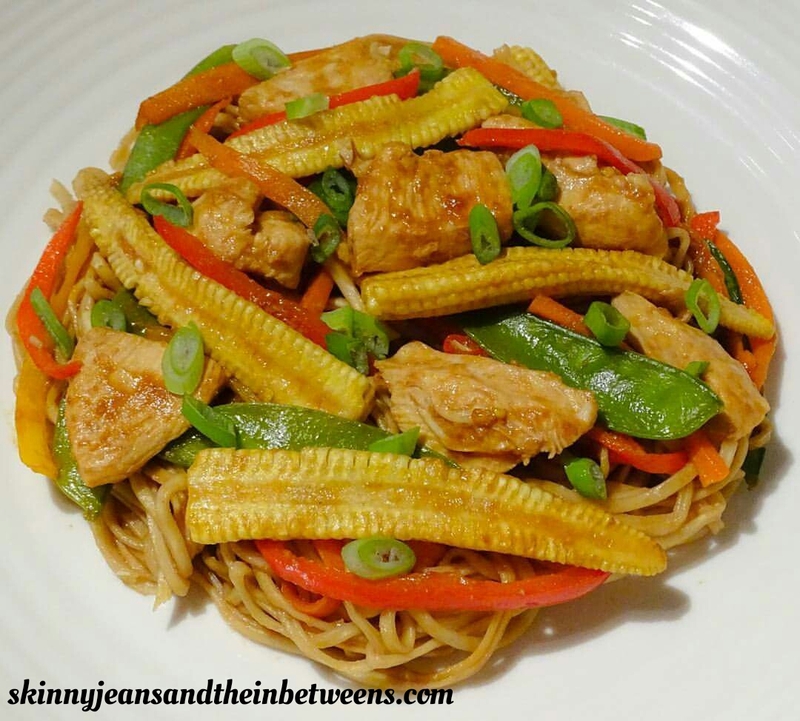 Add in the cooked chicken pieces and spring onion for a minute to heat through then add the sauce ingredients to the pan, cook until the sauce reduces down to a thicker consistency then add the noodles and sesame oil and stir through well to coat everything with the sauce. Divide evenly, serve and enjoy. 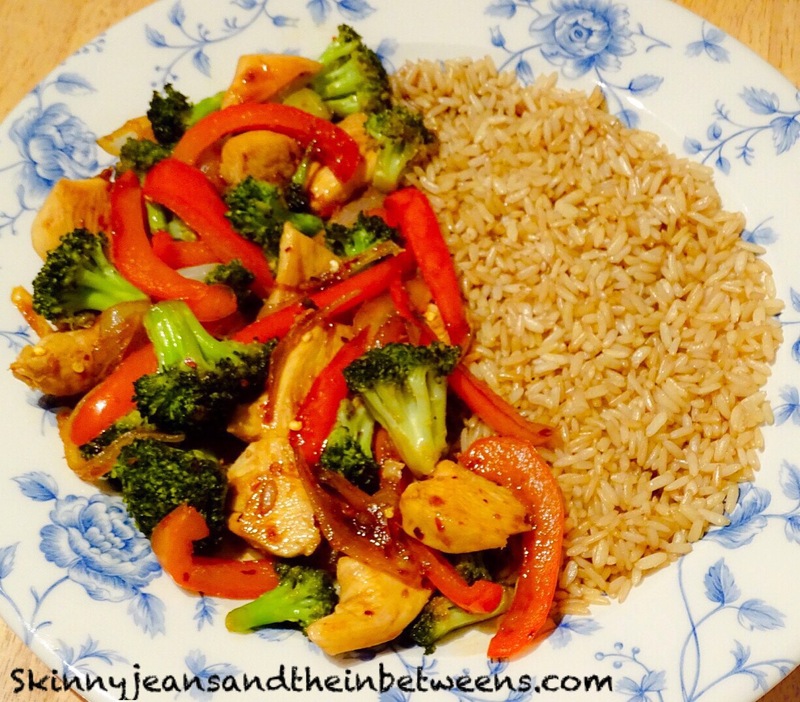 Healthy eating doesn’t have to be dull and boring, this healthy recipe will satisfy your cravings for takeout and can be thrown together in less time than the take-out delivery man would even be at your door with your order. Crispy battered chicken smothered in a spicy sweet sesame sauce sprinkled with sesame seeds & sliced spring onion on a bed of fluffy wholegrain rice, why it’s utterly downright delightful. January has never looked so darn good. This lovely lot serves 4 generously and comes in at just 13 Smartpoints a serving. The Macros per Serving are 494 Calories | Protein 39 | Carbs 68 | Fat 7. Place the semolina in a small bowl and add the 15g cornflour, Chinese 5 spice and season with salt & pepper. Mix together well. Set yourself up a little production line with your bowl of diced chicken pieces, your bowl of semolina mixture, another bowl with the egg beaten well and a plate to place the coated chicken onto. Meanwhile put the rice on to cook as per packet instructions. Place a large non-stick frying pan on a medium heat to preheat you can spray it with oil for extra non-stick factor if you wish, I always do. Dip the chicken pieces a few at a time into the beaten egg, shake off any excess and roll it around in the semolina mix. The idea is to lightly coat the chicken you are not looking for a thick or heavy coating, and place them on the plate until all the chicken has been coated. Alternatively, you could coat the chicken in the egg and place the semolina mixture in a large zip lock food bag and place the chicken into it shaking it around well until the chicken is fully coated, I have not tried this but have seen people coat meat with flour or spices like this before and its possibly quicker so go with whichever you are comfortable with. Place the chicken flat around the pan piece by piece in an even layer and cook over a medium high heat for 5 to 8 minutes a side or until browning and cooked through. Place the stock in a medium sized saucepan and add the rest of the sauce ingredients EXCEPT the 7.5g cornflour. Bring it to a light boil and place the cornflour in a small glass and add a tiny drop of cold water just enough so it fully dissolves the cornflour. Pour the cornflour mix into the sauce stirring continuously with a wooden spoon for a few minutes until the sauce thickens, it won’t be very thick it’s more like a slightly thick but runnyish coating. Once done pour the sauce over the chicken pieces in the pan and lightly stir ensuring all the chicken is well coated in the sauce. Plate your servings of rice and spoon over the coated chicken. 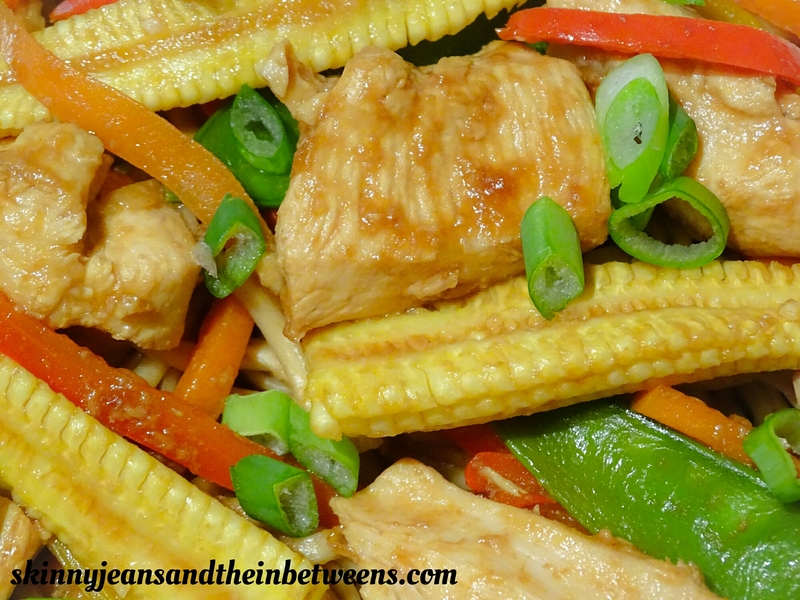 Sprinkle over some Sesame seeds and sliced spring onion and enjoy! This is best served straight away. 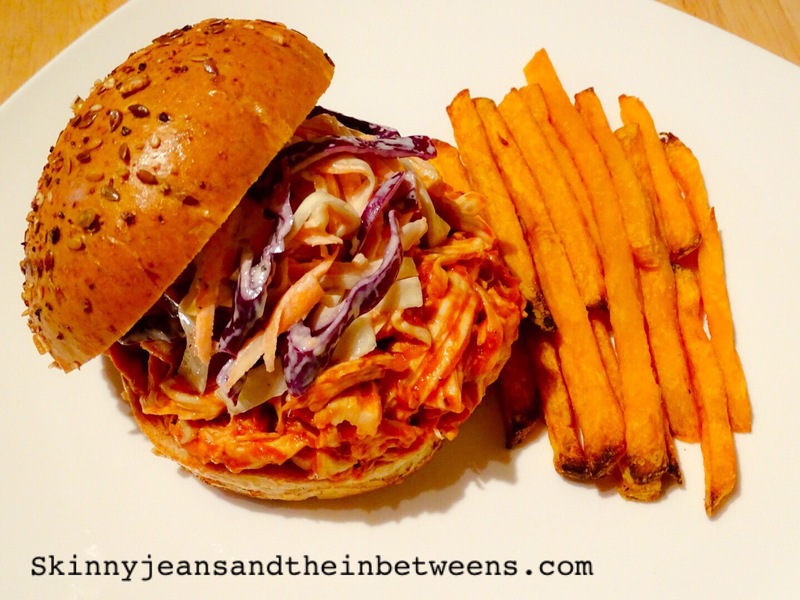 The juiciest tastiest pulled chicken sandwich with none of the hours of faffing about that pulled pork or chicken usually take. A beautifully glossy homemade smokey BBQ sauce that takes only 10 minutes to throw together and gorgeous shredded chicken that only takes half an hour! Quick, Easy, Delicious! Using chicken instead of pork for this pulled sandwich cuts fat & calories even further to make for a healthy alternative without losing any of the flavour or texture of the traditional recipe. The chicken is juicy and tender and remains that way due to being coated in the thick shiny homemade BBQ sauce. You can serve it with a wholemeal bun and delicious homemade coleslaw and fries I will also list the Macros and Smartpoints for the Chicken and Sauce on it’s own if you prefer to serve it with salad or rice instead. I sourced 99% of the ingredients for this in Aldi so they are easily accessible and cheap and cheerful too! The entire meal including all the trimmings as shown in the picture here serves 4 (The Coleslaw serves 6 you can add less veggies to make less if you wish) and it all comes in at 13 Smartpoints a serving / Macros per serving are: 533Cal P41 C61 F12. The Chicken in sauce will keep for up to 3 or 4 days refrigerated in an airtight container and it is suitable for freezing when fully cooled and on the day it’s made.